Though it won’t arrive in theaters for another year, 20th Century Fox is already hyping the release of next summer’s Abraham Lincoln: Vampire Hunter. Recently, The New York Times was granted with an early set visit. The Times (via The Playlist) revealed a first look at the film. The description was basic, but the premise of the film definitely matches the high-concept material that summer blockbusters are all about. Benjamin Walker stars as President Lincoln. Joining him are Anthony Mackie, Dominic Cooper, Mary Elizabeth Winstead, Robin McLeavy (of the Aussie horror release “The Loved Ones”), Jimmi Simpson (of A&E’s “Breakout Kings”), Alan Tudyk and Rufus Sewell. In 2010, Seth Grahame-Smith’s novel of historical inaccuracies became a New York Times best-seller. This mash-up of history and vampires is based on the faux diaries of the president given to the author by a vampire named Henry Sturgess (Cooper). Sturgess saved Lincoln’s life when he battled a vampire as a teenager, and the two become fast friends. 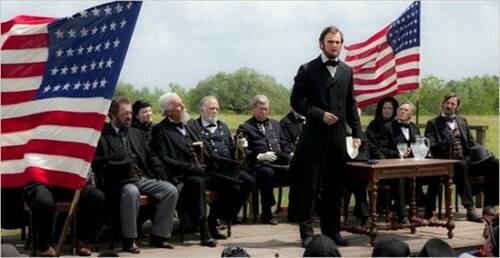 Sturgess teaches Lincoln about the history of vampirism, trains him in combat, and sends the president to hunt and kill evil vampires. Mackie will play the president’s best friend, Will. Winstead is Mary Todd, while McLeavy plays Lincoln’s Mom, Sewell as the head vampire Adam, and Tudyk as Stephen A. Douglas, leader of the Southern vampires. Audiences may be expecting tons of wooden stakes and bloodshed from director Timur Bekmambetov (Wanted, Night Watch), but the director sees this project as something bigger than just well-financed schlock. He describes it as a cross between D. W. Griffith’s Abraham Lincoln and F. W. Murnau’s Nosferatu. That’s an interesting mash-up to be sure. But will audiences gravitate to it? We’ll find out on June 22, 2012. Location : Oklahoma City, OK. I'm actually kind of intrigued by this. Depending how this looks, I might check this out. If done well, I could see this becoming a cult classic.